Welcome to Maintenance meets Productivity, a comprehensive maintenance and production support program for mixed corrugators. There are many contact persons, of whom ultimately no one has overall responsibility for the whole process. Each supplier has a different focus and is responsible for only a part of the process. You get reports, but are left alone to put these into action. Usually problems are treated in isolation. An overall plan with consideration of the entire environment is lacking. As a customer you can quickly feel isolated. You may find it difficult transferring the various proposals of the individual suppliers into a single overall concept. 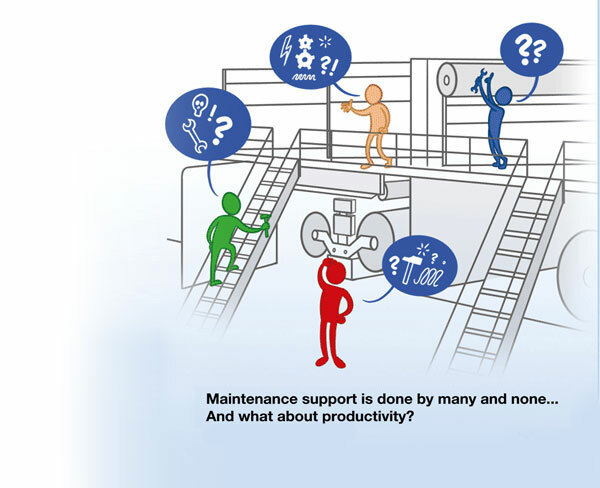 Wouldn’t it be ideal, if there was a support for maintenance and productivity improvement from a single source, regardless of the different machines on your corrugator? A partner who supports you in maintenance. A partner who can help you to achieve your productivity goals. Corr24 provides you with this support. supporting or carrying out maintenance. The package will be tailored to your needs and includes clearly defined modules. Planning and execution are checked by us. assistance in achieving your goals in the areas of increase of output, reduction of waste and improvement of quality. Spare parts and consumables are at your site before the actual need arises. This enables us to ensure immediate implementation of the measures from the packages mentioned above. A long-lasting partnership, which can be flexibly adapted to your needs and helps you to concentrate in your daily business on your core tasks. You can relax and leave everything else to the experts of Corr24.